The red carpet premiere of “SHINE,” in theaters Oct. 5, is coming up quick. 1 – pair of tickets to “SHINE” the Red Carpet Premiere on Tuesday, October 2 at Harmony Gold (7655 Sunset Blvd. 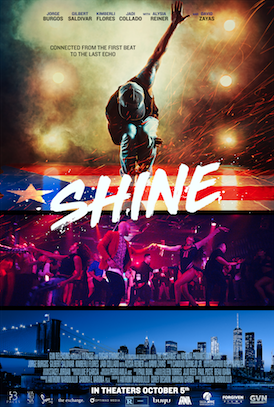 Los Angeles, CA 90046) Red Carpet begins 6:30 p.m. / Screening starts at 7:30 p.m.
“SHINE” is a NY-set Salsa dance movie which tells the story of two Puerto Rican brothers, Ralphi Matas (Jorge Burgos) and Junior (Gilbert Saldivar), from New York’s Spanish Harlem and the street’s best Salsa dancers, are separated after a tragedy only to reunite years later on opposing sides of gentrification. DARK PHOENIX | First Trailer + Poster Released!